Kim Kardashian, famous for being famous and for starring on the unscripted TV show Keeping Up with the Kardashians, is at the center of a lawsuit that could become legal precedent. She is not the first target of a defamation suit involving Twitter — that honor goes to musician Courtney Love — but it’s the twists and turns of Kardashian’s situation that make it unique. Kardashian first stirred up some debate last month when it was reported that she gets paid up to $10,000 for ads she sends out over her Twitter account to her 2.8 million followers. Derek Rey, co-founder of advertising company Ad.ly, says that she is the highest earner on the company roster. Other celebrities reportedly on Ad.ly’s roster include Stephen Colbert, LeVar Burton, Lauren Conrad and Dr. Drew. Those monetary figures had the blogosphere buzzing, but the discussion got even more heated when various news outlets reported that Kardashian had denied getting paid to tweet. Some people had mistakenly thought that Kardashian was denying sending any ads when apparently she was just talking specifically about fast-food chain Carl’s Jr. She had written favorably about the restaurant’s salads, but she clarified on her blog that despite a paid appearance in the company’s commercial, she was not paid to mention it via Twitter. Now, Kardashian is being sued by Dr. Sanford Siegal, creator of the “Cookie Diet,” for alleged libelous material in her Twitter stream. Dr. Siegal and his company, Dr. Siegal’s Direct Nutritionals, LLC, filed suit against Kardashian in a Miami court earlier this month. Dr. Siegal claims that what Kardashian wrote was defamatory. Added to the problem is the fact that Kardashian has an endorsement deal with QuickTrim, which she mentions in the first tweet but does not disclose her affiliation. Dr. Siegal says Kardashian was not adhering to Federal Trade Commission (FTC) laws. In October of last year, the FTC released new guidelines governing endorsements and testimonials from bloggers. There was a lot of confusion about the fuzzy guidelines (even on the part of the FTC), and it seems most people weren’t adhering to them. 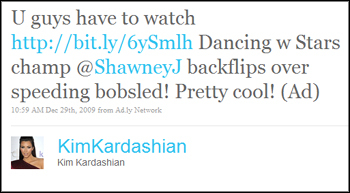 Despite being on Ad.ly’s payroll, Kardashian herself has only sent one tweet since December with the “ad” disclosure. The FTC could fine her up to $11,000 per undisclosed ad. Kardashian may end up being protected either because her posting will be taken as opinion, not fact, or because Siegal is considered to be a public figure, which makes libel more arduous to prove. However, in the meantime, she has an expensive legal case to fight. As many celebrities have been doing once they run into a little Twitter trouble, Courtney Love had deleted her Twitter account soon after the defamation charges hit. It remains to be seen whether Kardashian, who has had her Twitter account for over two years, will keep on tweeting. Image is a screen capture of Kim Kardashian’s Twitter stream.